Who's Got the Best Chili in Brooklyn? Pick your favorite chili, but go easy on the fillings - they're just distractions. Amateur and semi-professional chili enthusiasts from around the city face-off this Sunday at the Chili Takedown in Williamsburg, Brooklyn. The chili tasting competition has been spicing up the bellies of hungry New Yorkers since the winter of 2005, when actor/filmmaker Matt Timms first introduced the takedown. He's since taken the event to bars around town including The Slipper Room, Mo’s House of Satisfaction, Bar Matchless, the Soft Spot, and Union Pool - the site of this Sunday's event. Judges this time around are The Feedbag and Williamsburg is Dead'sKeith Wagstaff and TONY'sGabriella Gershenson. 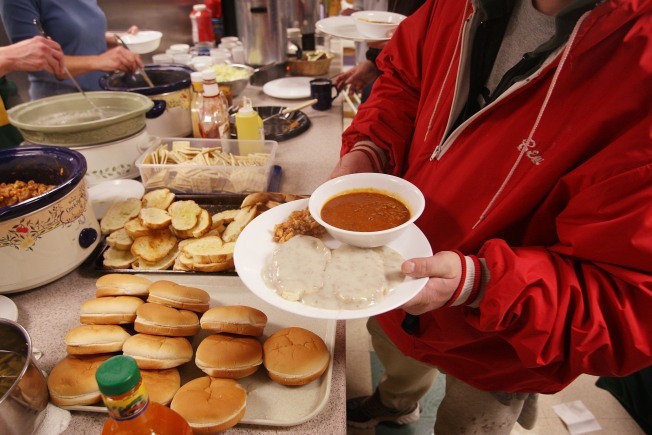 Wagstaff joking writes on The Feedbag that he can't be bribed, "except with whiskey, beer, cash, high fives and whiskey-soaked cash," a favorite type of currency for chili judges. For a door fee of just $10, takedown-goers get their fare share of home-stewed chili and "a chance to name the audience winner," reports the Feedbag.